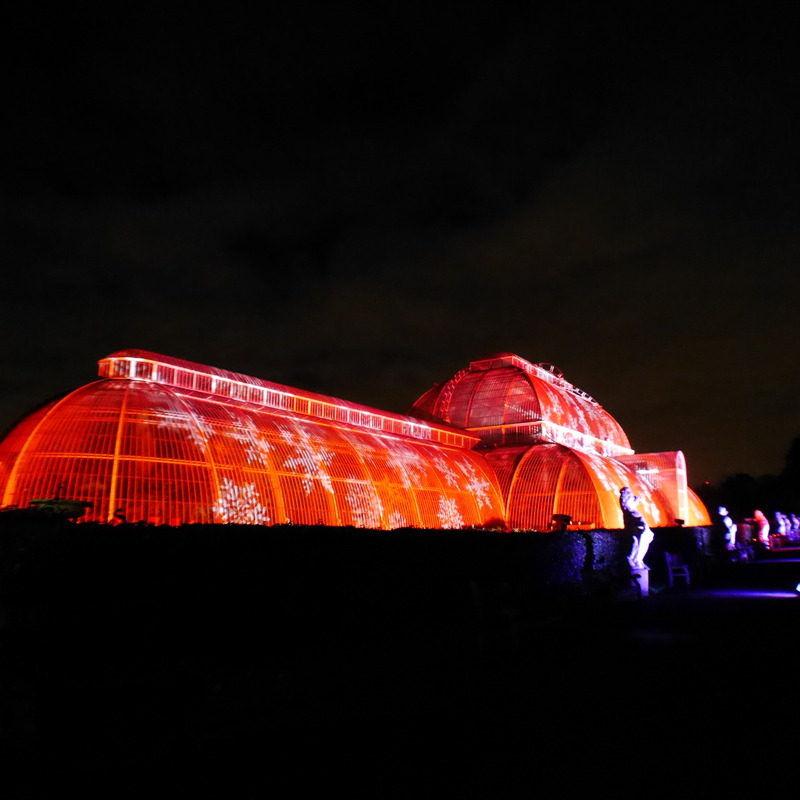 Garden Visits The Light Fantastic – Christmas at Kew. 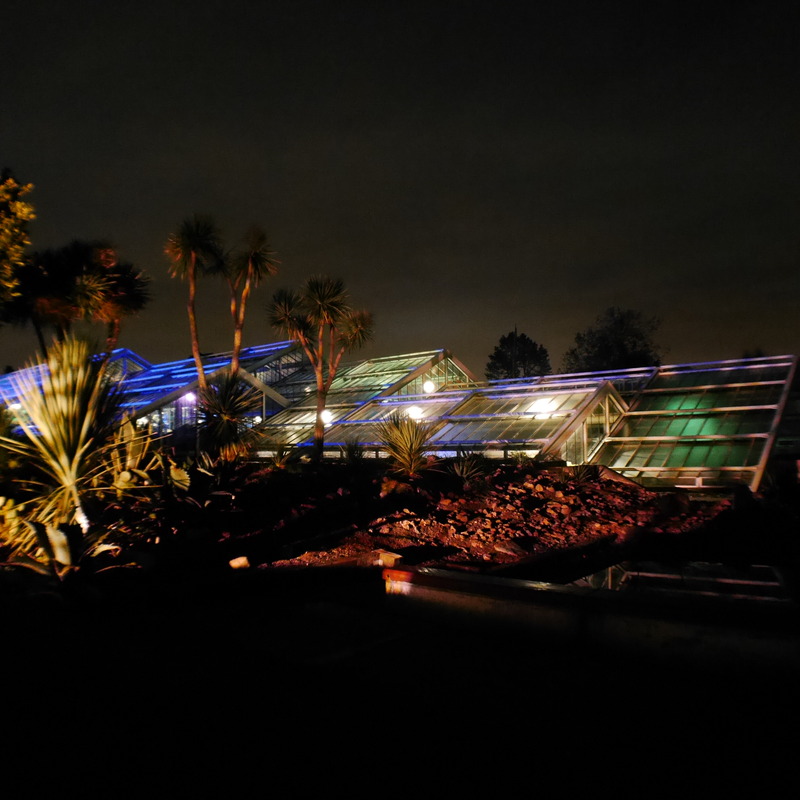 The Light Fantastic – Christmas at Kew. Singing Phoenix rising from a thousand flames. Breathtakingly beautiful. My favourite part of the trail. “In order for the light to shine brightly, the darkness must be present” – Francis Bacon. It’s been a weird, rather wonderful, week. On Monday, I was running around the Berkshire countryside dodging bullets, dressing wounds and getting covered in fake blood on a Hostile Environments training course. Run by ex-Army chaps for journalists who are often in the thick of major incidents, it helps us to do our jobs safely, protect each other and attend to any major medical traumas nearby – fellow journalists and members of the public. I now feel confident I could tourniquet an arterial bleed in virtual darkness and perhaps save a life or two. A lovely, life-affirming feeling. The downside of this type of course is it makes you hyper-sensitive to any perceived threat. As someone who lives centrally in London and utilises public transport every day (and watches/reads a lot of news! ), the threat of terror really is omnipresent, and on Monday, to me, it was tangible. A pantomime villain lurking in the wings patiently waiting for his sinister step out in the spotlight. Tuesday was cheerier. 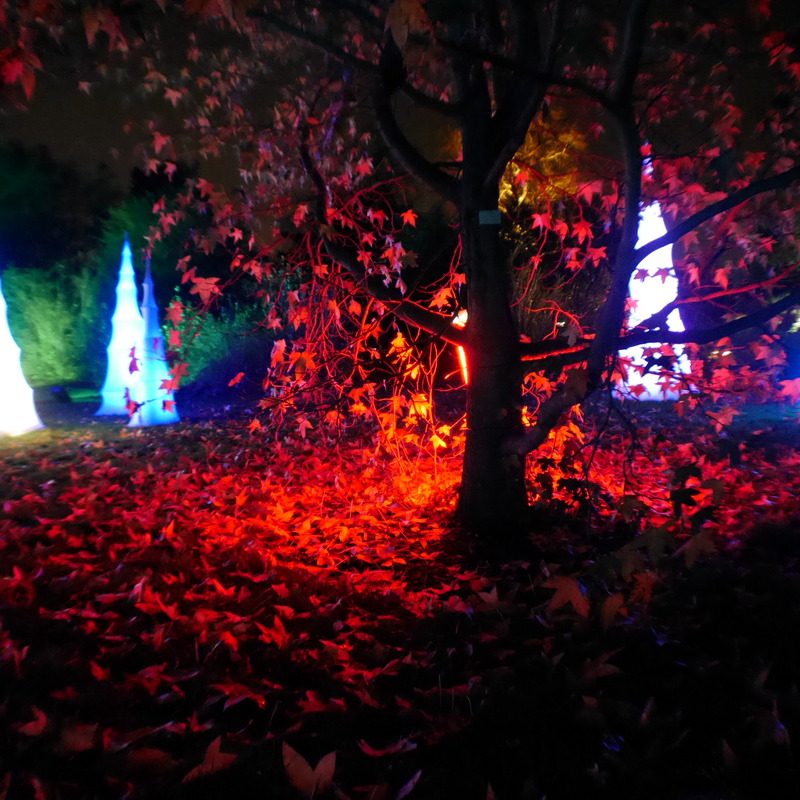 I was interviewed in my beloved but unseasonably mild Battersea Park about all things horticultural, for an Advent podcast about reconnecting with the magic of Christmas by the clever and charming writer/broadcaster/sometime comedian Daniel Ruiz Tizon. He kindly let me witter on about the importance of being outside and how time alone in nature, pottering in the garden, strolling in a park, away from people, away from shops and away from the TV, can help you reconnect with what’s really important in life. Those moments of solitude and stillness, of grounding yourself, of being in the moment, can be very therapeutic at Christmas time. And also rather good for hangovers. 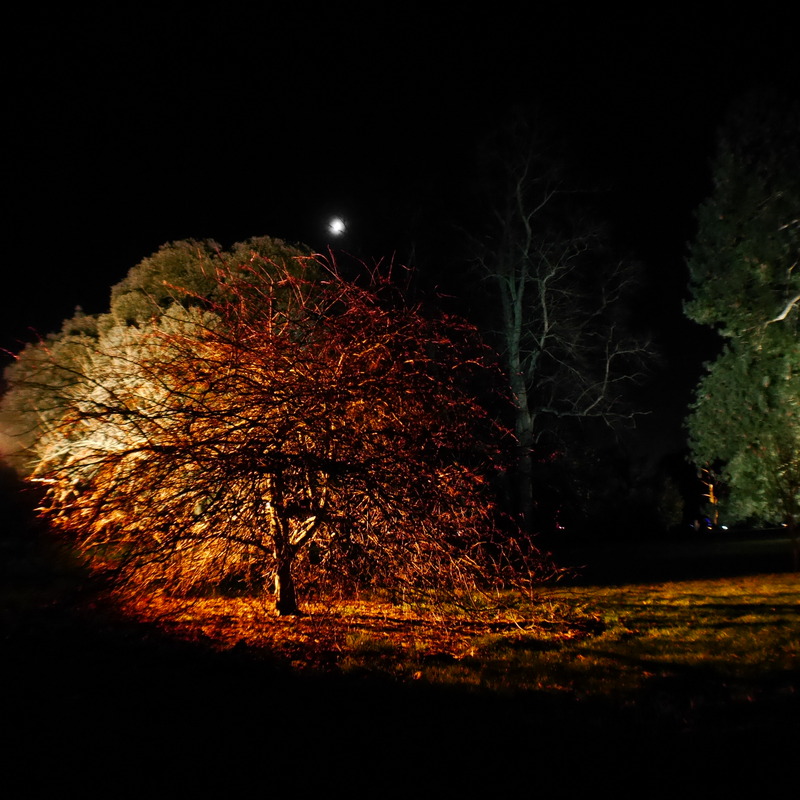 On Wednesday, after a tense morning of crowds (I hate crowds) and Christmas shopping (not terribly fond of that either), I was yearning for festive cheer, fresh air and some space – a spoonful of my own hippy medicine. 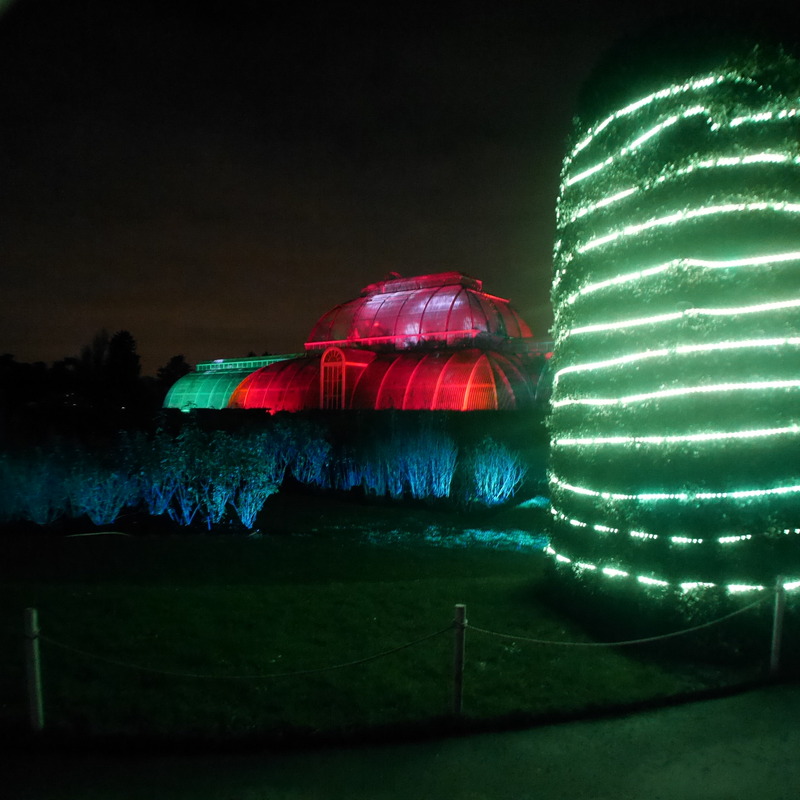 At 5pm I took myself and my camera to Kew Gardens to soak up the ‘Christmas at Kew’ experience. 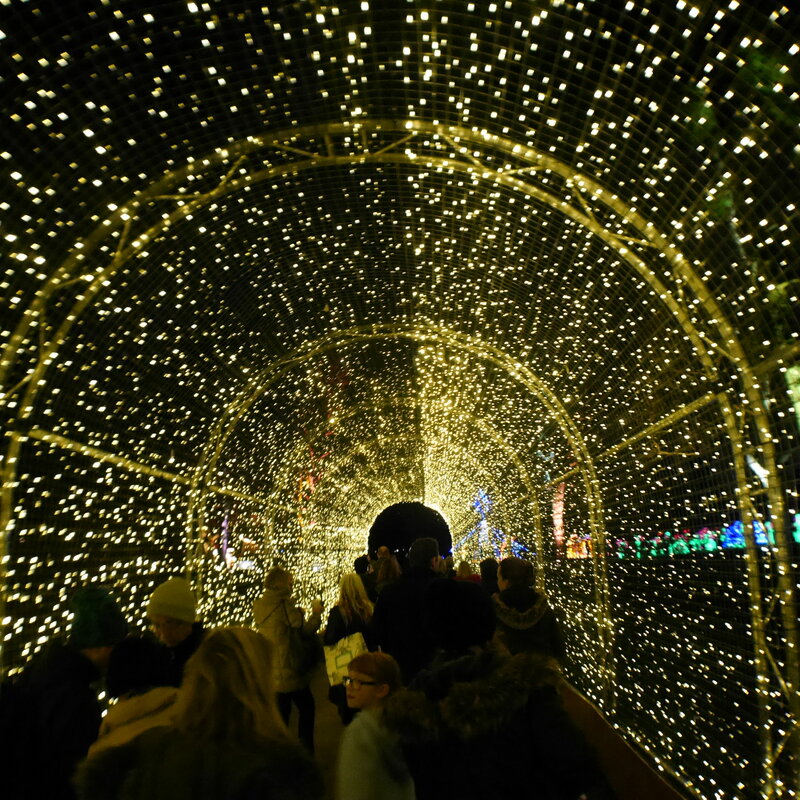 As I stood in the entry queue, bathed in the glow of a thousand fairy lights, surrounded by burbling children and cooing couples, I wondered if I stood out; standing there solo at an event that is so obviously geared towards romantic strolls and family outings. I’m a loner by nature and lucky to feel extremely comfortable in my own company, even though I’m aware some people find this weird. 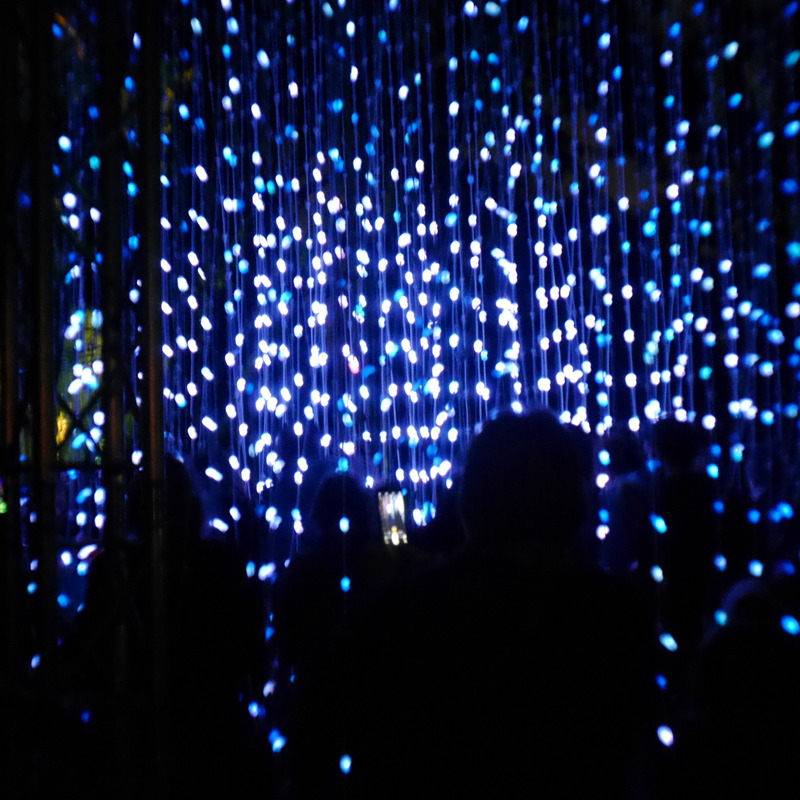 And whilst there is a great deal to be said for shared experience, sometimes I feel solitude can help us to fully and freely (and, in a good way, self-indulgently) experience things in a manner that being part of a couple or a group renders impossible. I was more engaged, immersed, less distracted. One of the highlights for me: beautiful Japanese maple in a pool of its fallen leaves. And I really was completely immersed. Dunked. Hook, line and sinker. 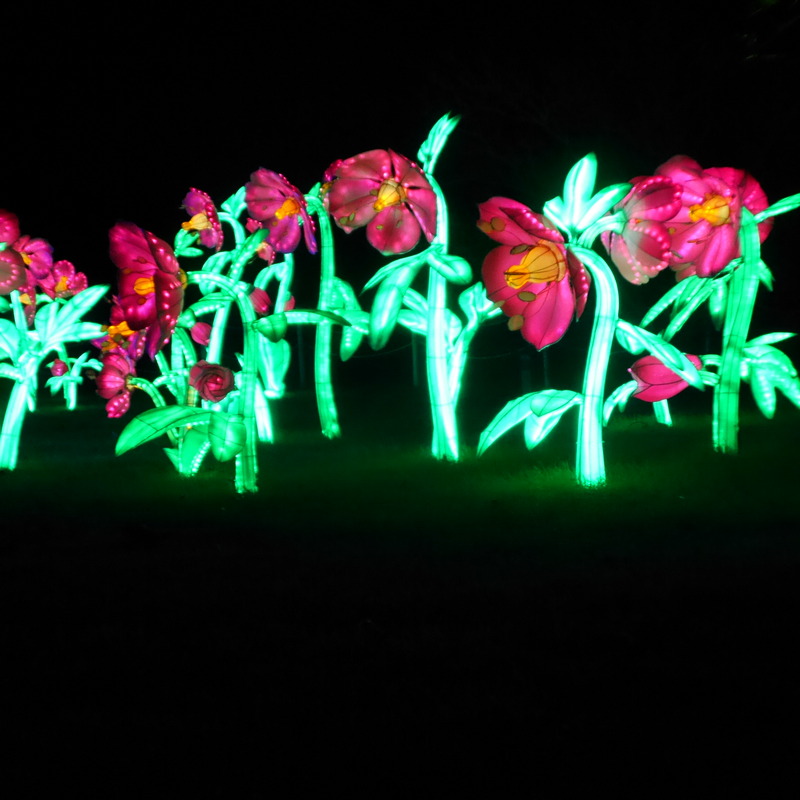 The whole experience of this mile-long illuminated trail was truly magical. Like being transported to a beautiful, enchanted forest. As I wandered the twisting path, I smiled gleefully at the choir of Singing Holly bushes, each one holding a different note and ingeniously triggered by the movements of passers-by. 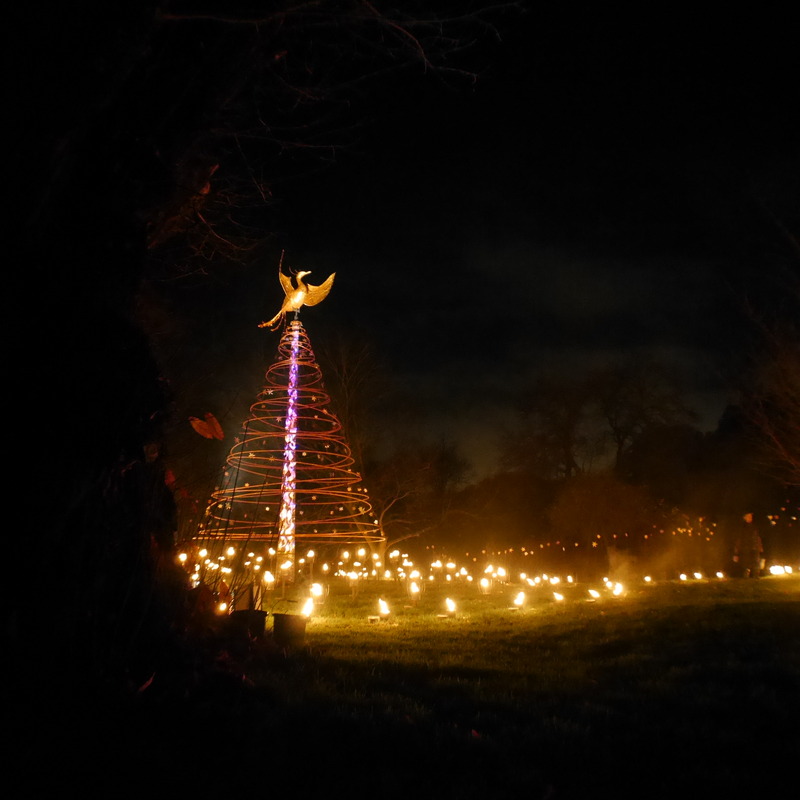 I felt goosebumpy and a little lump-in-throaty at the beautiful singing phoenix rising from the fire of a thousand candles. 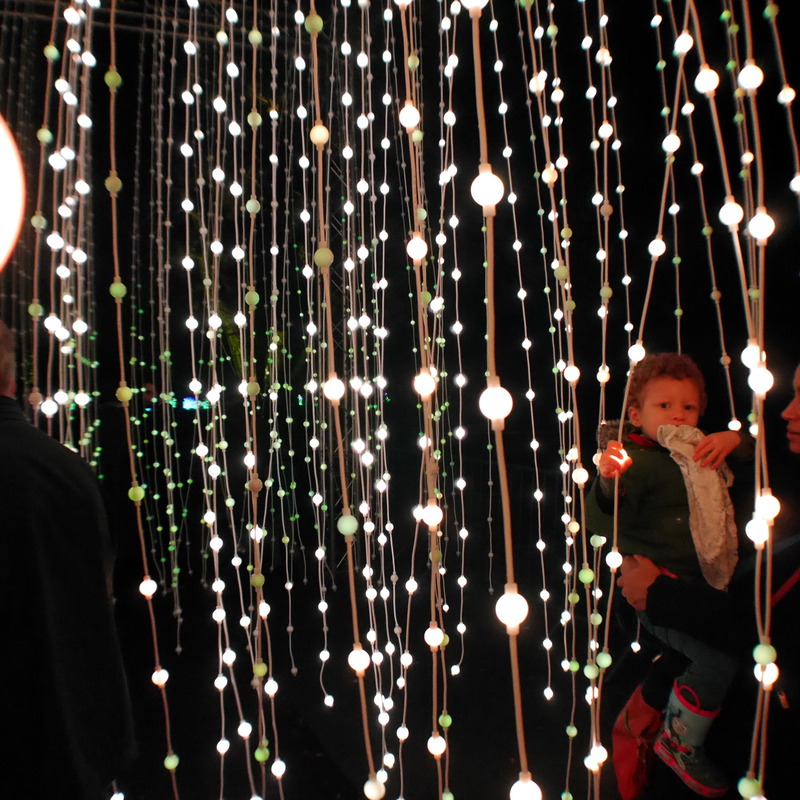 I couldn’t help but twirl around, like the children (and a couple of pensioners) surrounding me, inside the Squid Soup installation. 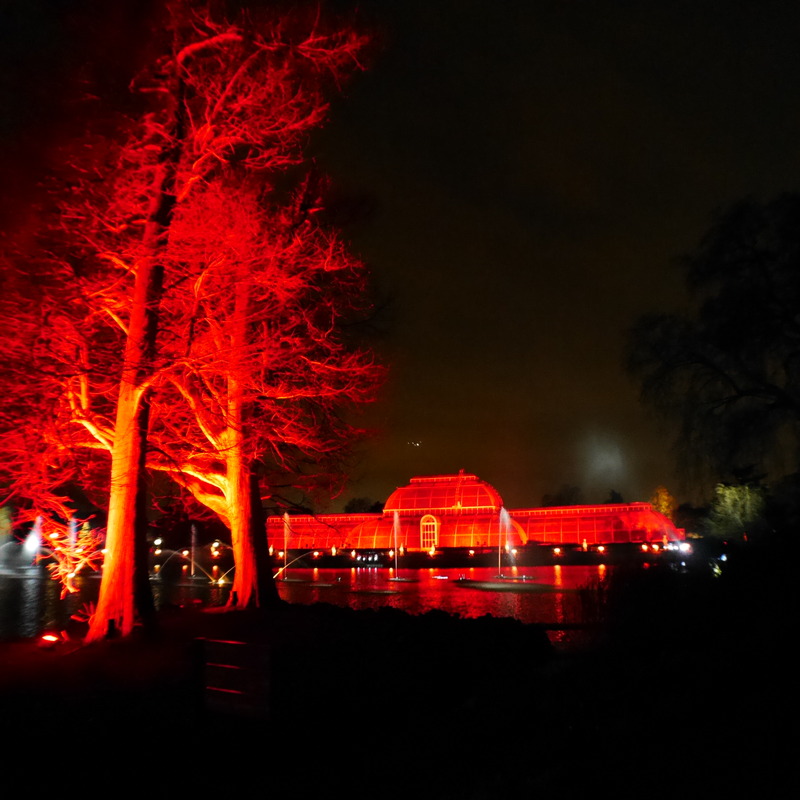 And watching the lighting display that turned the famous Palm House and the lake from hellfire red to icy igloo blue was mesmerising. 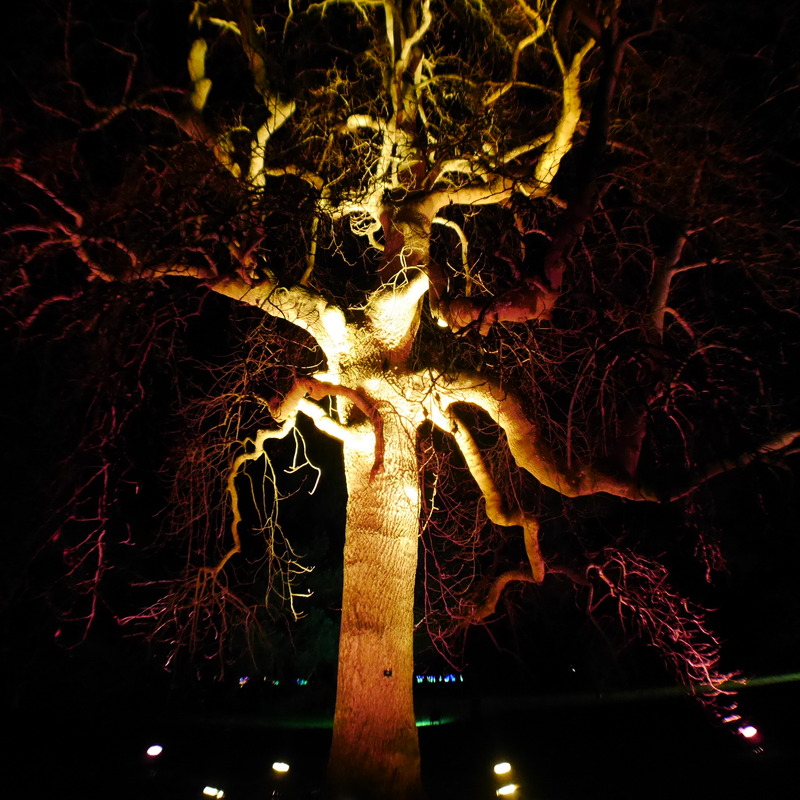 And at the heart of it all, the most remarkable of Kew’s trees were spotlit by uplighting; drawing attention to their gnarly bark, or their intricate branches, or the pretty pooling of their fallen leaves. 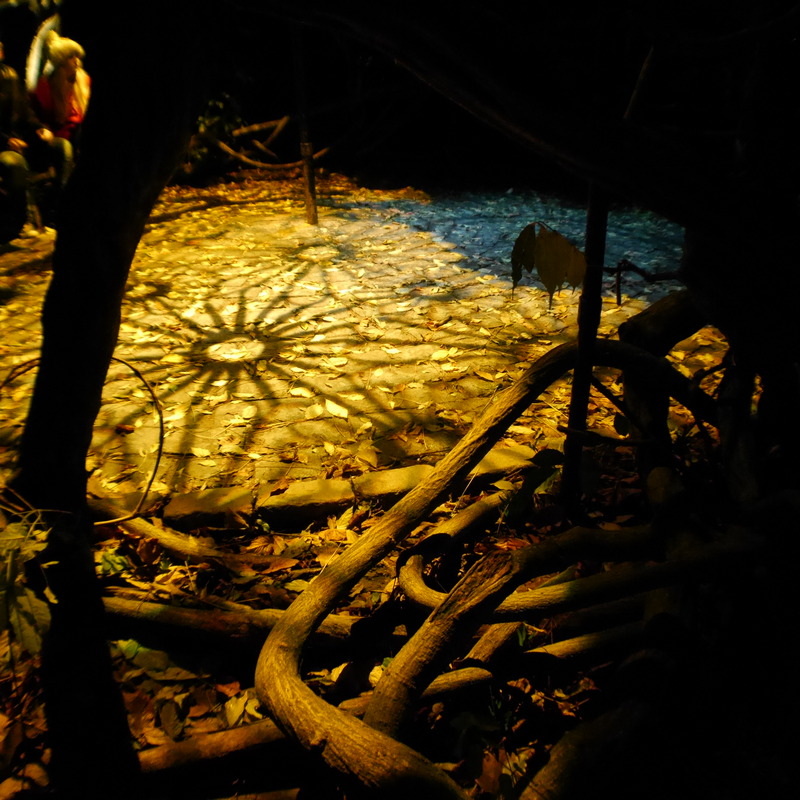 A trail of living, photosynthesising sculptures that had been cleverly and carefully curated to highlight the beauty of the nature around us. 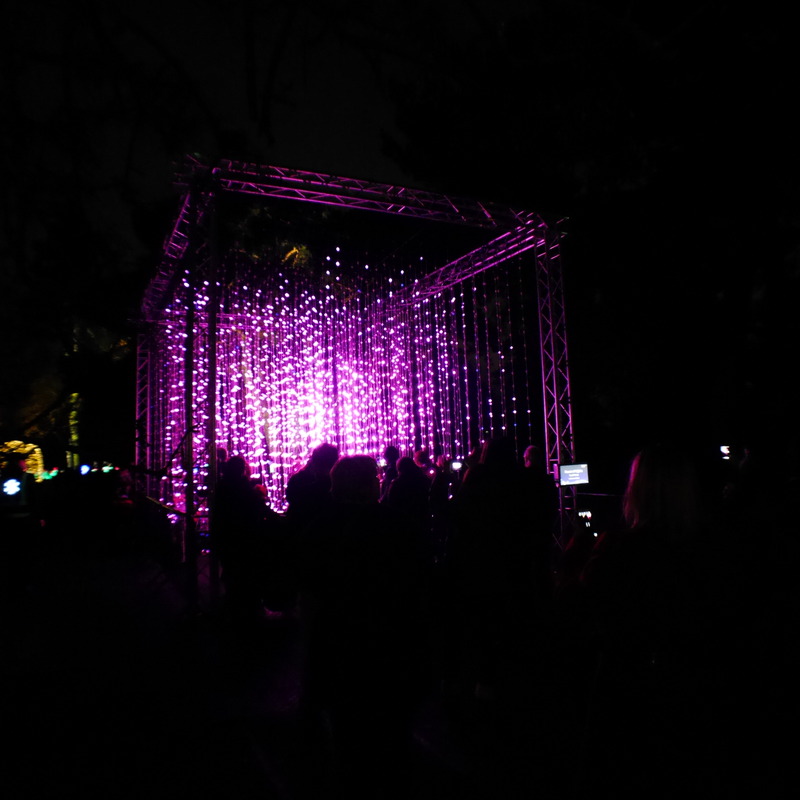 ‘Feast of Lights’ by Squid Soup. Wonderful rubbery tentacles. Like a disco beneath the sea. It made me feel better about life. I forgot about danger, about the darkness in the world, about the recent loss of my father, about work. 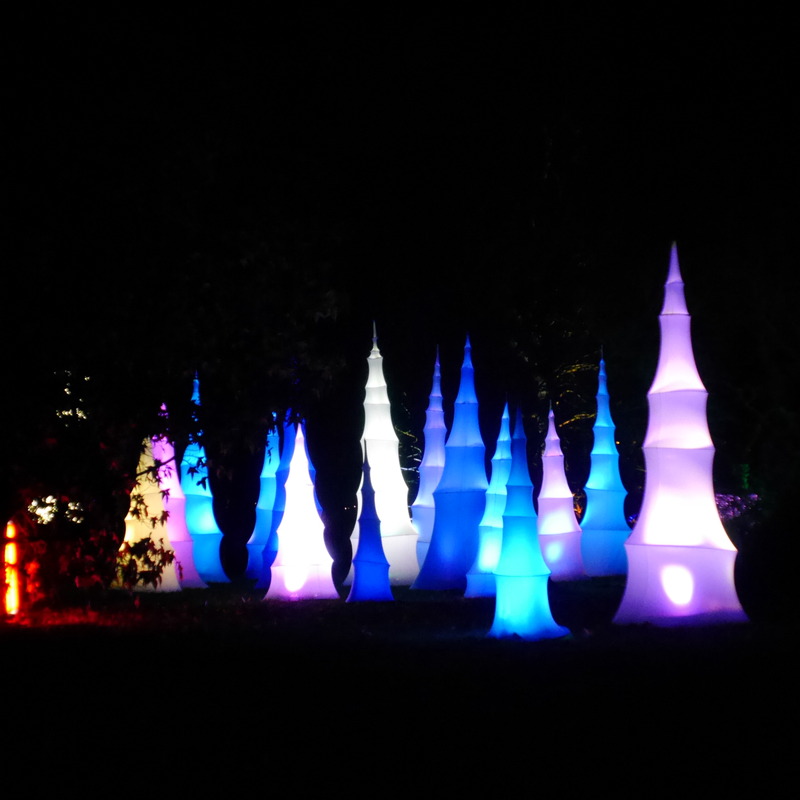 I was there, 100% present, in that enchanting Christmas forest. My inner child activated and entranced by every single sparkling second of the 90 minutes I spent there. A real pre-Christmas pick-me-up. I can’t recommend it highly enough for anyone in need of an injection of festive cheer, or beauty, or fresh air, or fun, or romance or delicious marshmallows, hot chocolate and mulled wine. Or indeed anyone in need of some last minute Christmas presents – the gift shop is credit card-meltingly wonderful. 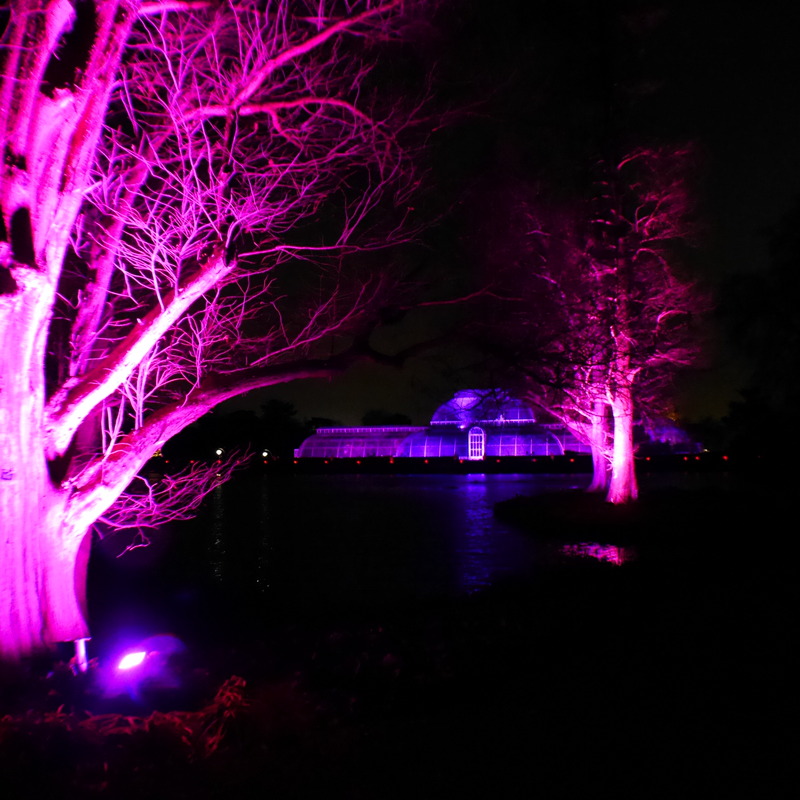 Christmas At Kew is on 5pm-10pm, Wednesday to Sunday until 2nd January. 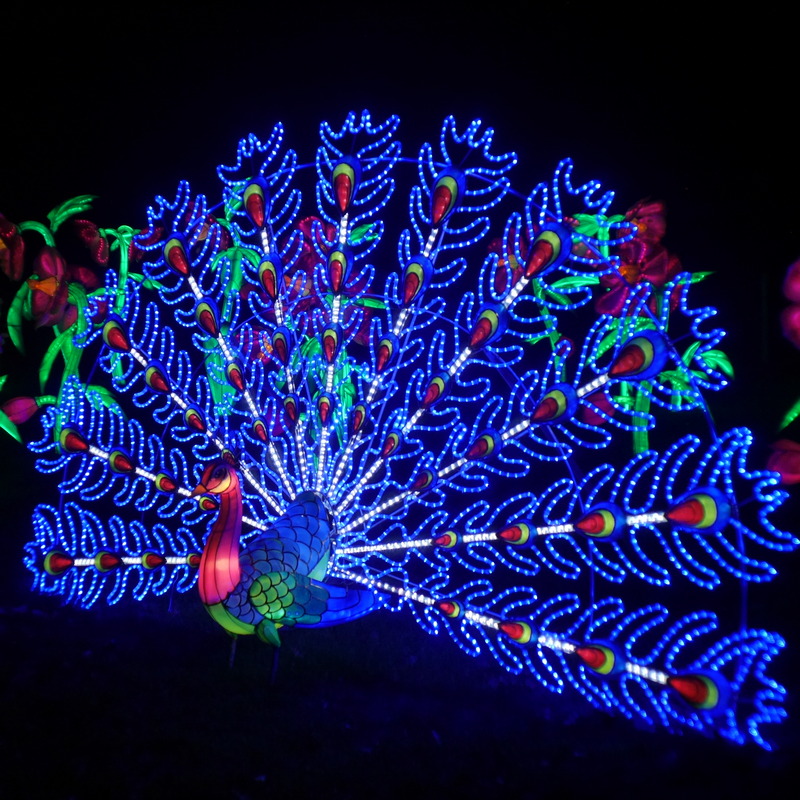 Tickets are available online and a small number are sold at the gates every evening. You won’t regret it. Alone or accompanied. If you do visit, I’d be interested to learn what your favourite experiences were. Please feel free to comment below. 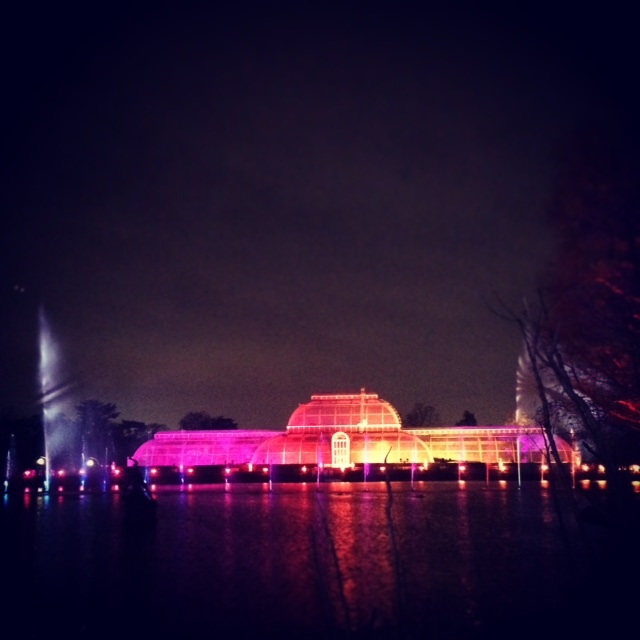 Christmas, holly, Kew, lights, magical, phoenix. Bookmark. You did it Beth, I mean this blog. I’m always struck by the honesty in your writing. Sorry to hear about your loss. Some of the above shots will gain you hundreds of ‘likes’ on Instagram. Maybe you don’t really care. You made me think about various issues: solitude and companionship; and the innate human desire to connect and share. Once upon a time, there used to be a ‘joke’ about Twitter – it’s for those who hate other people but hate to be alone. In some ways, this blog or Instagram serves similar purposes or else there is no need to self-publish and get feedback (likes and comments such as my rambling here …)? Perhaps, you and I are just like Tilly and Humphrey; yearning for unfettered freedom but knowing someone loves and will always be there for you at home. Have you not seen that famous hashtag (Twitter’s legacy to humankind in perpetuity) #InstagramNotWorking on Twitter when IG crashed a number of times in 2013/14? Also #FirstWorldProblem, #MyFoodisGettingCold and that people freak out when they can’t comment on others’ IG feed? I *so* used to be one of those sad souls who would get the jitters when Twitter went down. Now, not so much. Are you asking which Downton lady, I’d have been? Probably mostly Lady Sybil: idealistic, compassionate, stubborn. Perhaps we should move this convo to email?! Which Downton chap would you have been? It’s even more interesting revisiting this page and looking at your images compared with my own now that I have been.